According to a recent study, the industry is failing to take advantage of HIT’s ability to help control the spread of disease. A survey published in the Journal of the American Medical Informatics Association last year found that a large majority of respondents believe that EHRs (66%) and electronic health exchange (79%) will improve health care quality. Those numbers reflect the growing expectations that EHRs and the subsequent exchange of data through health information exchanges (HIEs) will enhance patient care and lower costs. However, a recent study in the American Journal of Infection Control suggests that these informatics tools either are being underutilized by hospital infection control professionals or aren’t optimally designed to further the cause of better care. While research has shown that electronic data exchange can increase the timeliness and completeness of infection reporting to local and national health authorities, it appears that many infection preventionists are unaware whether their hospitals participate in such projects, according to lead author Brian Dixon, MPA, PhD, an investigator at Regenstrief Institute and an assistant professor in the School of Informatics and Computing at Indiana University-Purdue University Indianapolis. The study, which was based on a survey of 44 infection preventionists from states with HIE networks, also found that while more than 70% of respondents have access to an EHR, fewer than 20% said they were involved in the system design, selection, and implementation. According to the authors, without that kind of involvement, these electronic information systems don’t include components that support the preventionists’ job activities. Another issue involved concerns about ease of use, specifically infection preventionists’ ability to access information faster and more efficiently when they need to document a notifiable case. “Infection preventionists commented that they often need to ‘fish’ or ‘dig’ or search (in some cases ‘for hours’) within their current electronic systems to find the data and information they require,” Dixon and colleagues wrote. Other concerns were about interoperability and data completeness. Kathleen Roye-Horn, RN, CIC, an infection control director at Hunterdon Medical Center in Flemington, New Jersey, and vice chair of the Association for Professionals in Infection Control and Epidemiology’s Practice Guideline Committee, concurs that infection control does not appear to be a priority when it comes to EHR selection. For her, Dixon’s findings ring true. “Hospitals are moving as quickly as they can to become more electronically connected, but the primary focus of the development of these programs hasn’t been infection prevention or infection surveillance,” she notes, adding that she was involved in her organization’s EHR selection process, but discussions were more focused on how to make it user friendly for clinicians. Dixon says the study’s findings have several implications for public health. If infection preventionists aren’t familiar with or interacting with HIEs, then it will be more difficult for them to provide public health officials with the data they need to adequately monitor population health. In his article, Dixon points out that electronic data exchange has been shown to improve infection control practice. He referred to a study in which researchers examined a large metropolitan area and detected 286 patients who generated more than 4,000 inpatient days in which the receiving hospital was unaware of a prior history of methicillin-resistant Staphylococcus aureus (MRSA). The researchers implemented a clinical reminder through an HIE to alert infection preventionists when patients with a history of MRSA were admitted to their facilities. In the first year of operation, the program delivered almost 2,700 admission alerts for patients with a history of MRSA, one-fifth of which was based on information that came from a different health care organization. Roye-Horn is involved with a New Jersey program whose objective is to measure the potential value of electronic HIE for infection control purposes. About a dozen years ago, amid concerns about bioterrorism, the state implemented a system in which hospital emergency department records were mined for data on certain syndromes. The resulting information is downloaded into the information systems of local and state health departments. Dixon says the less-than-optimal interactions between infection preventionists and EHRs may have implications not only for public health but also with regard to growing concerns about providing more efficient, cost-effective health care. If infection preventionists are spending an inordinate amount of time performing manual tasks that could be automated, he says it’s a waste of health care resources. 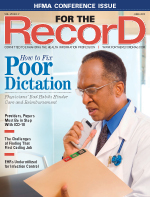 There could be several reasons for EHRs’ minimal focus on infection control. Viet Nguyen, MD, chief medical information officer of Systems Made Simple, a provider of HIT systems and services, says there are time and labor costs associated with developing alerts and reports based on lab tests. He also notes that HIT systems originally were designed to deal with billing and reimbursement issues and still are evolving, giving some hope to infection preventionists who want a greater voice in design decisions. “As the health IT industry matures, we will identify ways for technology to measurably improve care,” he says. Dixon says providers should examine their IT budgets and overall investment in HIT, and then define a strategy to support infection control. While acknowledging that EHR systems primarily are designed for frontline health care professionals such as physicians and nurses and for clinical documentation purposes and meeting meaningful use requirements, he says other health care interests also should be addressed. In addition, he says there must be more informatics research devoted to finding how EHRs can better handle infection data. Stronger algorithms to help detect when patients have hospital-acquired infections or to distinguish between community-based infections and hospital-acquired infections are among the possibilities for greater specificity. “I think we also need some research in the area of better natural language processing techniques to identify things like catheter-associated urinary track infections,” Dixon says, adding that much of this information is documented in dense clinical or laboratory notes where infection preventionists ideally would like to see a simple quantitative result that confirms whether a patient has an infection.